Who Benefits from Adoration Servants? What good does Adoration Servants do? We help other servants! We are not here to compete with the number of worthy Eucharistic Ministries be they at the Parish, Diocese, National, or World level. We are here to help them! Our Chapel Management System is a powerful Eucharistic Adoration System to manage all the activities associated with running a chapel. With this system, a single chapel leader can literally do what an army of chapel leaders, division leaders, and hourly captains do, in a fraction of the time. The primary beneficiaries of Adoration Servants are the actual adoration servants in the trenches. We benefit Chapel/Parishes which includes Pastors,Prochial Vicars, and the Laity, Dioceses which includes Bishops, Other Eucharistic Ministries, and the Knights of Columbus who consider themselves Knights of the Eucharist providentially positionioned to take a leadership role in the renewal of parish life and who are looking for ways to reach out into more parishes with an active presence. We believe, along with Blessed Mother Teresa and Blessed John Paul II, two heros and exemplars to us all, and two saints particularly identified within the Knights of Columbus as peoples whose dreams should be fulfilled, that Eucharistic Adoration is the key to world renewal and is a key part of the lay apostolote explained in the Vatican II Decree on the Laity. We want so much to help those trying to make this happen! We pray that all the Catholic world will participate in regularly scheduled holy hours of Eucharistic Adoration. We live for it. We pray for it. We sacrifice for it. Let us us help you. If you are a chapel leader at a parish doing any level of adoration, our tools will make your life much easier. You are really the one we want to help most. We have so much to offer you free and ready to go. You will have a bit of a learning curve but once you make the switch you will never regret it. The system allows setup as your chapel wishes to use it, from single chapel leader to 24 hours captains and 4 division leaders. Any way, shape or form, you can benefit. Automated Color-Coded Chapel Shedule Charts show EVERYONE the status and needs of the Adoration Chapel. Now everyone in the parish can know what the chapel needs, not just the chapel leaders after often exhaustive analysis of hard-to-read, hand-written log sheets that numerous hourly captains eventually get around to trying to figure out. The examples below come from three chapels using the system to meet their needs. The database creates a color-coded Chapel Shedule Chart that shows how many scheduled adorers there are for each hour and, depending upon settings, what the "health" status of each hour is. The idea is the everyone can see read and yellow hours need the help of more scheduled adorers. The colors can be determined in a number of ways and are especially useful the attendance features of the system are taken are used. Chapel Chart Example 1 is from a Chapel that takes advantange of the attendance features which can statistically calculate the probability that all scheduled adorers will be absent at the same time, thus risking the dreaded chapel vacancy. The red hours are red because past attendance gives cause for warning. Also Tue 5AM and Thu 3AM show yellow indicating some attendance issues. Chapel Chart Example 2 is a 24/7 Chapel that does not use the Servants attendance features and chooses to color code the chart at 2 or more scheduled adorers green, 1 adore yellow, and 0 red. Chapel Chart Example 3 has opted to keep hours green even if only 1 adorer. In this example Sat 10PM is red with 0 adorers and the other three red hours with 1 adorer indicate an attendance issue. Adoration Servants are not the Adoration Police. Our systems facilitate how you have decided to manage your chapel in your diocese under the policies and procedures of your bishop and pastor. We just make it easier for you to do it! The Adoration Servants Messaging Tools allow for numerous ways to contact adorers, en masse, individually, or in groups. Automated messages keep everyone notified of scheduling changes. Adorers are notified regarding their partners and the hours before and after them Chapel attendance gives full visibility of the strength of hour coverage. Depending on the maturity of the chapel, as well as the experience and changing pressures upon the scheduled adorers, Chapels can be left vacant during exposition regardless of phone trees and other antiquated type methods. The chapel leaders themselves often bear the brunt of hour substitution which can cause needless stress on chapel personnel. Our on-demand sub request emails allow subs to be found within minutes, as the examples below show. When used in conjuction with other chapel policies and procedures, the pressure of finding subs and keeping adores completely informed is greatly relieved. Click the Emailing System User Guide image link below for more explanation. Reminders planned for development Manually maintained spreadsheets printed out and distributed Chapel leaders do much of the subbing. Charts can be created for “Sign-Up Sunday” events. 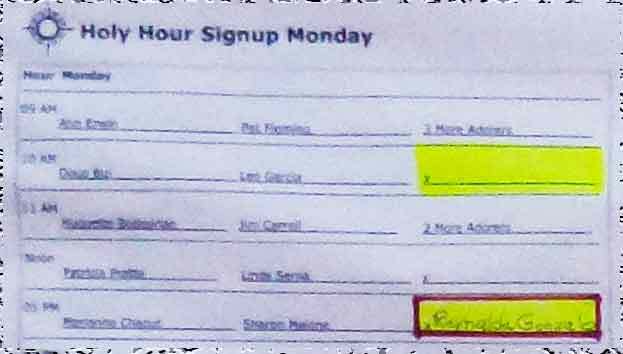 The blurred tearoff of the Signup Sunday poster form shows how things work. 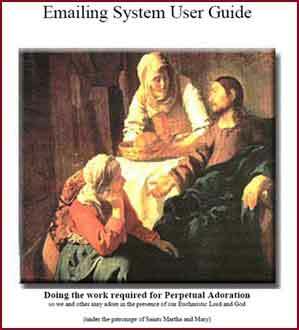 Using the poster thoughout the Sunday signup process parishioners look at the needs and sign up for hours. Various explanations are given to them. 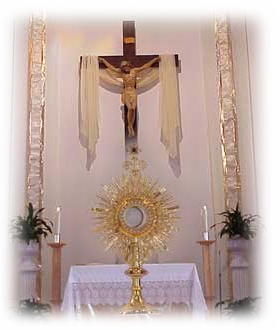 Often the homily incorporates Eucharistic Adoration. Adorer signup. 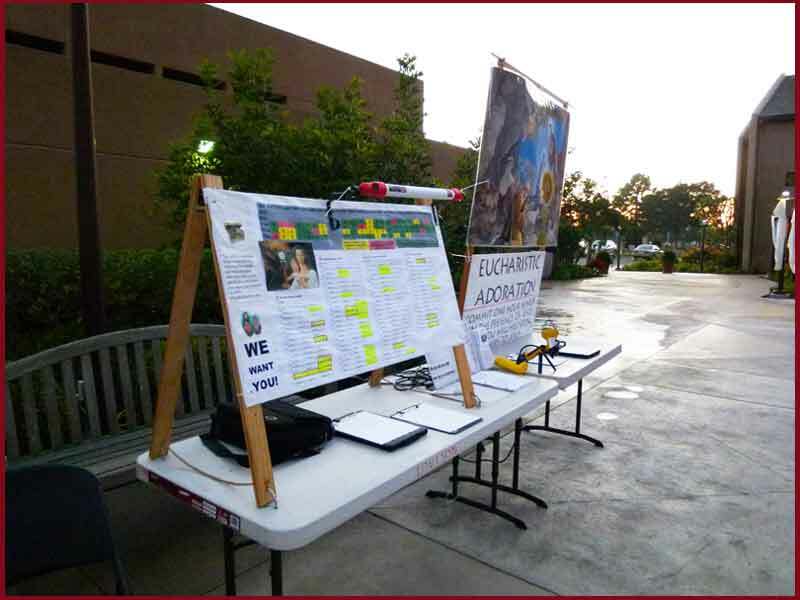 They fill out Signup forms such as those available on this website's collaberation page, those signin forms are entered into the Adoration Servants system, and the adoration is stronger by new adorers. The blurring was intentional due to the seriousness with which we take the privacy of adorers. Video demos and training are not made available to the public at this time but a number of videos are available upon request. If your diocese has organized efforts for Eucharistic Adoration or if you don't, we can likely help. 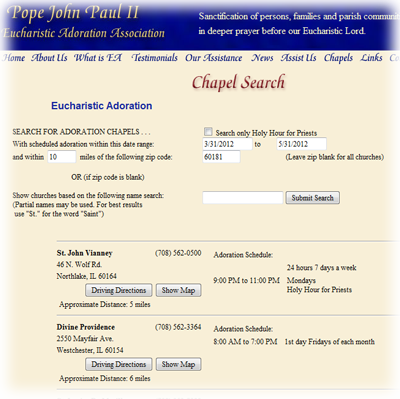 If you have a pdf or spreadsheet listing your Adoration chapels but you don't have any kind of search methods so people can narrow down their needs, we can help. If your chapel leaders cannot effectively communicate with you, let alone with each other, we can help. If you cannot communicate to your adorers around the diocese in all the different chapels, well, we can help. Our tools have been effective and substantial at the diocesan level and our plans, God willing, are to do much more. When your chapel information is in more than just a manually updated spreadsheet, word document, or personal data tool, that same information can be leveraged for more and more valuable information. In Chicago the chapel database was leveraged to allow for not only chapel name searches, but also for zip code chapel searches within specified mile limits and time limits. Why give someone a list of all the chapels in Chicago, or San Antonio, or Los Angeles, or St. Louis when you can give a list specific to the area where the adorer is actually is? In addition, a chapel database can be used for more detailed devotions, like Chicago's "Holy Hour for Priests" which are scheduled throughtout the diocese throughout the month. As already quailified, God willing, Adoration Servants plans on doing much more for the diocese, and those organizations serving them. We have already began Google mapping with pinpoint locations on a diocesan map. We plan to develop mobile phone apps and data so "Eucharistic Adoration" will come up on phone and GPS searches. There is a sophisticated mass email system where a diocese can setup email groups and send emails out to those groups as needed. We have incorporated the SIFT Systems data warehousing tool so those who need the data can retrieve it in an myriad of ways as they see fit, and export the data to Excel, should they so desire. If you are involved in a Eucharistic Ministry where you are promoting Adoration, training, organizing, whatever it may be, Adoration Servants may be able to help you take a load of work off your hands. 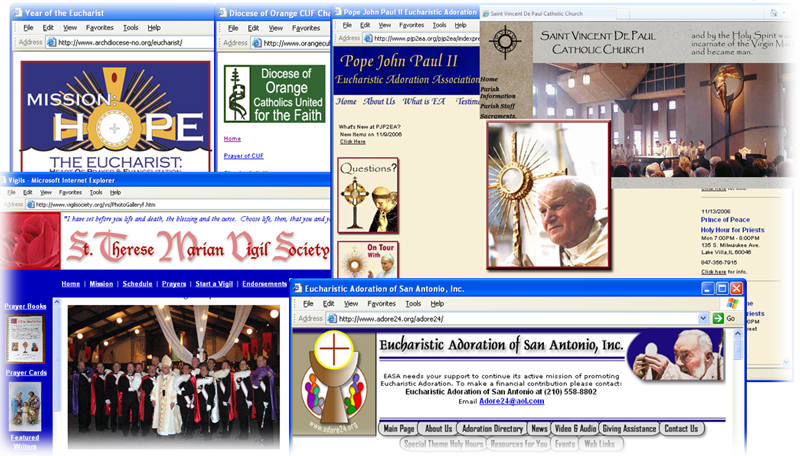 There are a number of worthy Eucharistic organizations having a hard time keeping up with currrent technologies. Indeed, even with our help this can be a significant and frustrating task. Many pay a lot of money to have professional organization do the work only to realize they still have much work to do AND NOW they also have recurrring expenses. Just scroll back up this page and review how Adoration Servants can help parishes and dioceses. Much of this work falls under Eucharistic ministries. Are you one of them?